Explanation: Might this distant planet hold water? Actually, given how close Gliese 1214b is to its parent star, any water, if it exists, would surely be in the form of steam. 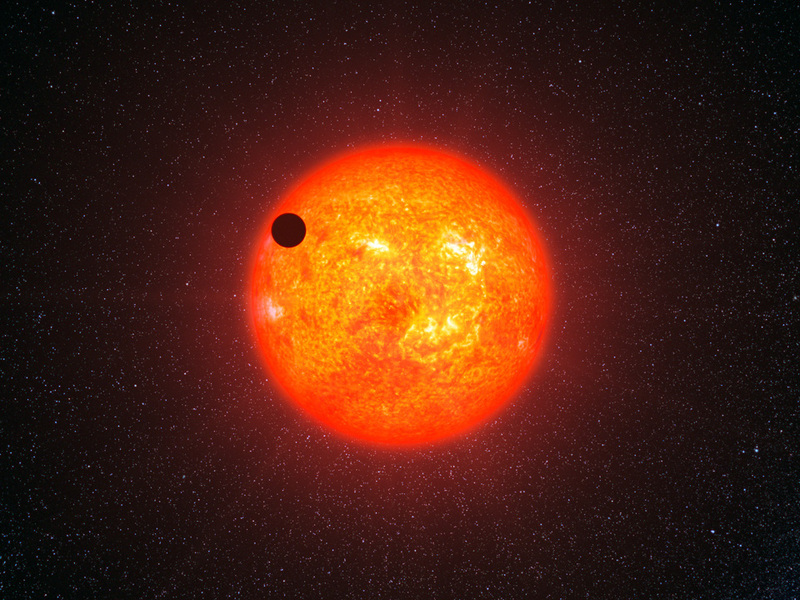 In the above artist's illustration, the super-Earth Gliese 1214b is imagined passing in front of its parent star, creating a mini-eclipse that alerted humanity to its presence. Gliese 1214b, also designated GJ 1214b, has been designated a super-Earth because it is larger than the Earth but smaller a planet like Neptune. The entire Gliese 1214 planetary system is of the closest known systems to our Sun, located only 42 light years away. The parent star, Gliese 1214 is a slightly smaller and cooler version of our Sun. Recent observations from the Subaru telescope in Hawaii found very little scattering of blue light from the parent star by the planet. This appears most consistent with a planet that has a watery atmosphere -- although it is still possible that the super-Earth has clouds so thick that little of any color of light was scattered. Detecting water on exoplanets is important partly because most lifeforms on Earth need water to survive.